Ken Rigsbee, P.E., F.NSPE and I.T. Gonzalez, P.E. In 1974 the Board of Trustees of the Texas Engineering Foundation (TEF) decided that the engineering profession needed a visible, focal point in Austin, so they acquired the land and commissioned the construction of a new Texas Engineering Center at 3501 Manor Road, right across the street from the Austin Municipal Airport. TEF leased the building to the Texas Society of Professional Engineers where it served as its headquarters until 2004, also housing the headquarters of the Texas Section of the American Society of Civil Engineers. By 2004, the airport had moved and the Texas Engineering Center was crowed and isolated. So the TEF Board decided to liquidate the asset and assist TSPE in relocating to leased space downtown, just a block from the Texas State Capitol. In late 2004, TEF was contacted by I.T. Gonzalez, P.E., a long-time TSPE member and the former president of the Victoria Chapter. He remembered the Texas Engineering Center as a beautiful place where he once attended state committee meetings, and after a little negotiation, he purchased the building for I.T. Gonzalez Engineers and Surveyors. 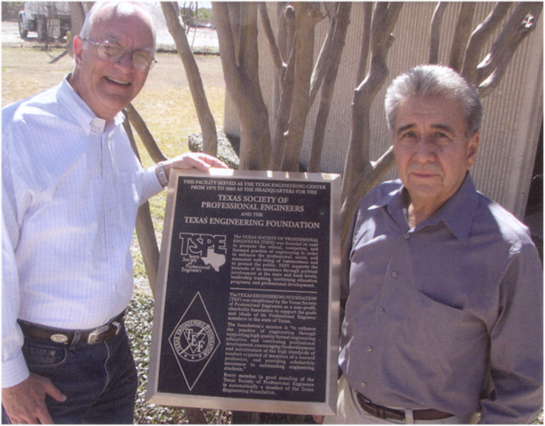 In view of the history of the building, Mr. Gonzalez and the TEF jointly underwrote a plaque honoring TEF and TSPE, and their presence at the building between 1975 and 2005. The TEXAS SOCIETY OF PROFESSIONAL ENGINEERS (TSPE) was founded in 1936 to promote the ethical, competent, and licensed practice of engineering in order to enhance the professional, social, and economic well-being of its members and to protect the public. TSPE support the interests of its members through political involvement at the state and local levels, leadership training, continuing education programs, and professional development. The TEXAS ENGINEERING FOUNDATION (TEF) was established by the Texas Society of Professional Engineers as a non- profit, charitable foundation to support the goals and ideals of its Professional Engineer members in the state of Texas. The foundation's mission is "to enhance the practice of engineering through supporting high quality formal engineering education and continuing professional development, encouraging the development and maintenance of the high standards of conduct expected of members of a learned profession, and providing scholarship assistance to outstanding engineering students." Every member in good standing of the Texas Society of Professional Engineers is automatically a member of the Texas Engineering Foundation.